Who doesn’t love spending their weekends with a rod and reel? However, the line may get tangled and in addition, you may still need to dress your catch. And that’s why, a good pocket knife is such an important item to have. In this review, we’re going to break down the kind of qualities that we think are extremely important to look for when buying a fishing knife. We’ll also go to great lengths to recommend the top 7 pocket knives for fishing. Hopefully, this breakdown will help you enjoy your day on the water. Below, feel free to use our comprehensive table to compare and contrast some knife varieties. You can read our in-depth analyses on the reviews below as well. 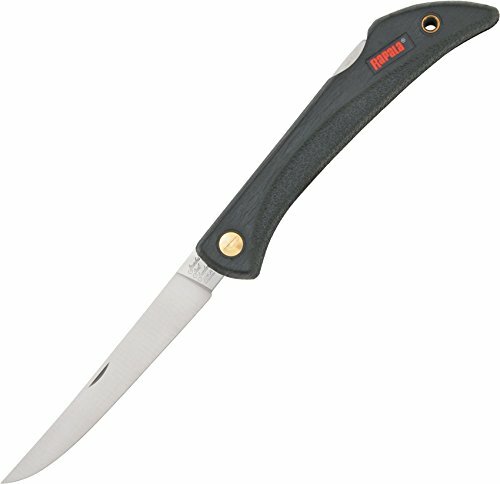 Buck-0220BLS Knife boasts many features to make an excellent fish cleaning knife. The blade is manufactured from 420J2 Steel and coated with flexible Titanium for a sturdily built and corrosion-resistant cutting surface. The size makes it easy to handle both medium and small-sized fishes. The blade is razor sharp and easy to sharpen, cutting through to the backbone. It is also strong and flexible to make a good filleting knife. In addition, the blade is thin to penetrate fishes when filleting easily. The handle is designed with a rubber coating and grooves which together with the stainless steel safety guard make the handle an anti-slip unit. 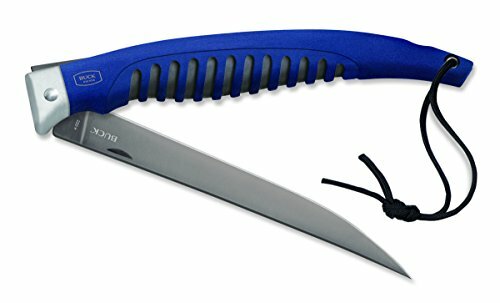 The knife is foldable to nearly half its length and therefore easy to pack in a tackle backpack. Further, it comes with a lanyard for your convenience. The knife has a mid-lock back feature for locking it when it is not in use for safety. The knife is affordably priced and is backed by the manufacturer's lifetime warranty. Rapala-5 Fishing & Camping Knife turns the work of cleaning and filleting fish into a quick job with its features. 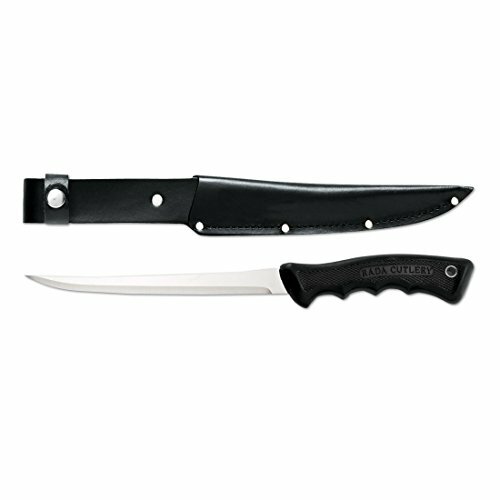 The knife is affordably priced and is ideal for a variety of kitchen and outdoor uses. It is a five-inch blade knife manufactured from Swedish surgical stainless steel for flexibility, durability and corrosion resistance. The blade is thin, narrow, strong and sharp. The thin blade enables it to penetrate hard meats like turkey or chicken. In addition, the thin blade works effectively during filleting. It is a foldable knife, which make storing and carrying it convenient, and therefore perfect for outdoor use. The knife has a strong lock-back feature to keep it from injuring anyone when not in use. The handle is textured and has a soft-grip for a comfortable and secure hold when cutting, and gives you control when cutting meats or filleting. Rada-Cutlery Knife makes a great fishing companion. It is an affordable knife with special features for filleting fish. Additionally, it is recommended for other kitchen uses like slicing, deboning and cutting. The knife is backed by the manufacturer’s lifetime guarantee. It is a lightweight knife and easy to carry in your tackle box. The knife has an overall length of 12-1/4 inches. The blade is manufactured from hand sharpened T420 high carbon stainless steel for a razor sharp edge. The blade is 7-1/8 inches, and this makes it a medium sized knife able to handle medium-sized and large fishes effectively. The blade is thin, flexible and sharp and does fish filleting effectively. The handle is manufactured from black rubber to make a soft-rubber grip. The handle is also firm and non-slip and gives the user control even when handling wet slippery meats. The knife comes with a clip for locking the handle in place. When not in use, a black leather scabbard is provided for conveniently carrying it or storing it away. The scabbard protects the user and makes carrying the knife on a belt convenient. 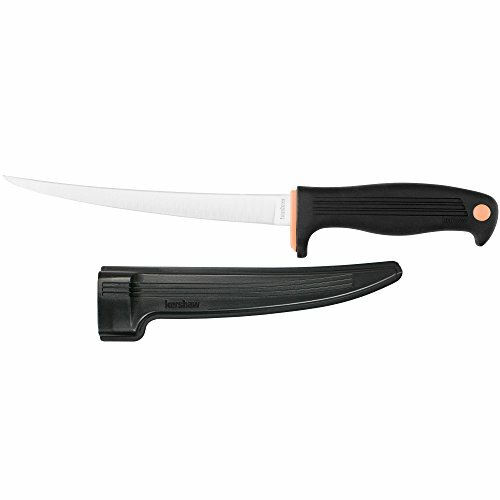 Morakniv- Comfort Fillet Fishing Knife is an affordable cutting device designed for use in extreme weather conditions. There are two blade lengths provided to suit your cutting needs, 6.1 inches and 3.5 inches, the smaller model suiting small fishes while the bigger one managing medium and large-sized fishes. The bigger size has two belt clips options, a clip-on or belt-loop while the small knife comes with only one belt option to make carrying the knives easy. The bigger knife weighs only 3.5 oz. (99g) and has an overall length of 10.6 inches (270 mm). The knives are constructed light to make great outdoor cutting tools because they are easy to carry. The knife comes with a patterned, high-friction handle for a firm, non-slip grip. In addition, the handle does not absorb odors. Havalon-Baracuta Edge is a premium folding knife that also does a good job at cutting other meats to make a great fishing and hunting knife. The blade also fits #115SW serrated bone saw blade and also Havalon's #115XT hunter’s blade for a versatile three in one knife. The blade is designed to be easily replaceable when it gets dull, and the good thing is that a package comes with five blades. The blade is a surgically sharp high-quality unit manufactured from micro-honed stainless steel material. The length of the knife is 11 inches long. The knife is compatible with #115SW and #115XT blades. The open back makes cleaning the knife easy. 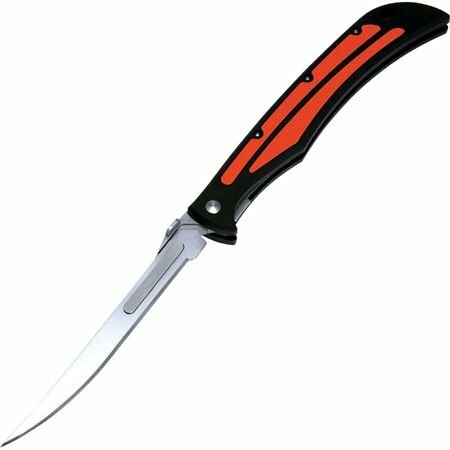 The handle is made from a blend of high quality and rugged plastic, namely military grade polymer and orange grips to give the user control when filleting because it is non-slip. It has ambidextrous thumb studs that make working with the knife convenient. 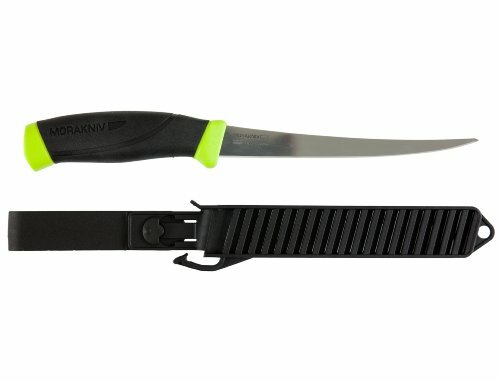 The foldable knife comes with a nylon holster. Kershaw-Clearwater is manufactured by Kershaw, a company based in the USA. The company has a good reputation in knives manufacture spanning four decades. The knife is very budget-friendly and is backed by the manufacturer’s limited lifetime warranty. 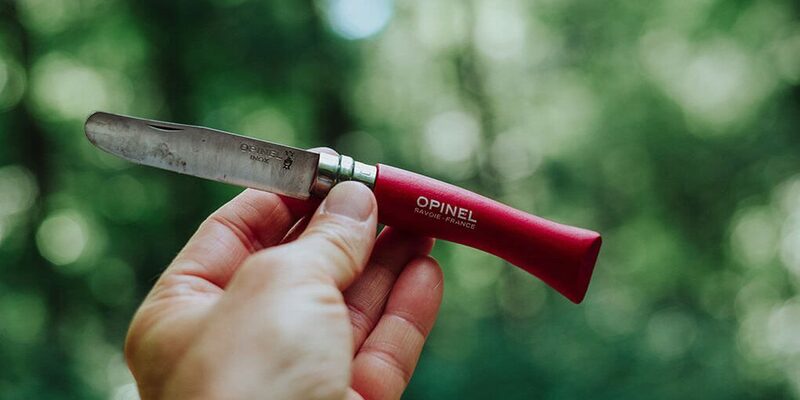 The knife makes a perfect outdoor and kitchen knife. The blade does an extraordinary job at filleting by balancing flexibility and sturdiness. There are two blade options provided, 9 inches and 7 inches long for the convenience of cutting small, medium and large sized fishes. The blades are manufactured from Japanese 420J2 stainless steel which is a corrosion resistant material, making the knife suitable for use in freshwater and saltwater fishing. It has an ABS Sheath with a belt holster for easy storage, carrying and blade protection. The knife features a handle manufactured from copolymer material. The handle is also textured to give it a firm grip even with wet hands. 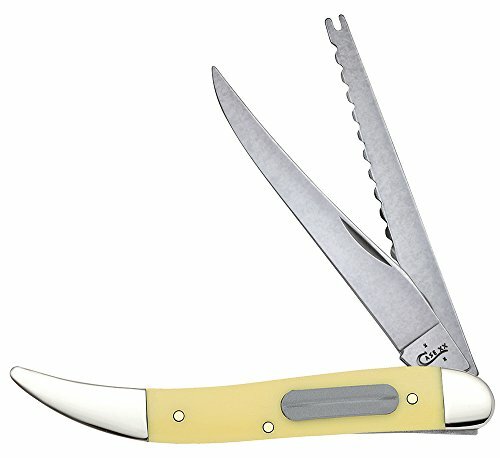 Case-Yellow Fishing Pocket Knife is manufactured in the USA. It is a pocket knife that makes a great outdoor knife. It is foldable and comes in a visible yellow color for easy visibility. The knife is designed as a fishing knife. The knife measures 4.25 inches when closed and weighs 2.7 ounces. The blades are manufactured from hardened steel and taken through a steel treatment process. The blade is Tru-Sharp stainless steel, which is a combination of stainless steel and carbon material. The materials make the blades sharp, sturdy and corrosion resistant. It is designed with two blades. It has a long Clip blade which serves as a standard blade for multipurpose outdoor and kitchen functions. The other blade is a scaler blade, and it is serrated and good for scaling fish. It is not sharp which allows the scales to be removed without cutting into the fish skin. In addition, the tip of the fish scaler has a disgorger for removing fish hooks. It also has a special hook sharpener. So, what makes a good fishing knife? Well, in our expert opinion, the three factors that matter the most are the blade materials, handle materials and blade shape. Let’s see why each one of those three matters. You want to go for a blade that offers a great edge quality along with enhanced corrosion resistance. Ideally, your knife’s handle should be slip-proof under different conditions. It should be easy to handle even with sweaty or wet hands. The best blade type of fishing a fishing knife is one that’s long and thin. This design comes in handy especially when filleting. The Buck-0220BLS knife is probably the best there is on the markets currently. Its blade is made from high-quality material. Its design makes it highly flexible meaning it can easily be used for dressing. It also has a pretty well-made handle. No matter the situation, you should always try your very best not to compromise on the quality of your pocket knife. Luckily, for you, there’s a buying guide and the latest reviews provided for you. So, go ahead and make a confident decision.